Last week an Amazon package was delivered to my door, which is always exciting. I had ordered a Fuliwen pen after seeing a Youtube video, and a Valery refillable notebook which I had found when browsing notebooks. I am unfamiliar with the Fuliwen brand. Amazon says this pen was made by a “famous company in China called Fuliwen”. I thought the barrel and hardware was very pretty, although now that I see it in person I am not a fan of the pearl bead on the clip. The section is an interesting shape, one which I have not seen before. The material is advertised as celluloid but I would be surprised at this price point: $19 Cdn. The medium nib is on the small side for the size of the section I feel. It is stamped Straffen, which I read are made by X-Fountain Pens. I cleaned it and tried to find a blue ink that would match the barrel. Clockwise from top: Noodler’s Blue Upon the Plains of Abraham, Parker Blue Quink, Paradise Pen Blue, Waterman Serenity Blue, J. Herbin Blue Myosotis, and Lamy Blue. I chose Parker Blue as the best match to the barrel. And here’s the writing sample. I chose a Clairefontaine notebook. The pen is very smooth with no skips or hard starts, and it started writing as soon as it hit the paper. I was using it in my regular journal later on that day, and it suddenly went dry. I shook it a few times and it resumed writing. But it will never be a favorite pen of mine. That pearl bead is ugly, as I mentioned before, and the pen can’t be posted, which this pen needs, due to it being super light. It just doesn’t fit well in my hand either. But I can’t fault it’s performance, other than running dry once, which was soon fixed. I also purchased this notebook and cover, made by Valery. It’s not leather but a very nice imitation. I really like the white stitching and the tree motif on the cover and in the charm bookmark. There is another charm on the spine of an eagle with wings unfurled. It doesn’t seem to fit in with the tree motif; kind of sinister really. But luckily it can be removed. Here is the inside of the notebook cover. The cords could easily be loosened to release one or both of the charms if needed. The notebook is pretty standard, lined with very thin paper. I do not know the gsm. I didn’t have high hopes for the pen test but it stood up fairly well. I’m just realizing now I deleted the photo of the opposite page. Oh well there was no bleed through and just a touch of ghosting. And very little feathering. Safe for our fountain pens. Overall I am happy with the pen and notebook. Taking a chance on unknown products can be fun. An exciting delivery from Amazon. The pen looks pretty. The running dry once might just be due to ink staying at the back end of the converter due to surface tension and is not necessarily a defect…just physics. It might be solved as your hand warms the ink. Otherwise a light tap should do it.I enjoyed your ink test page too, methodical and colourful. 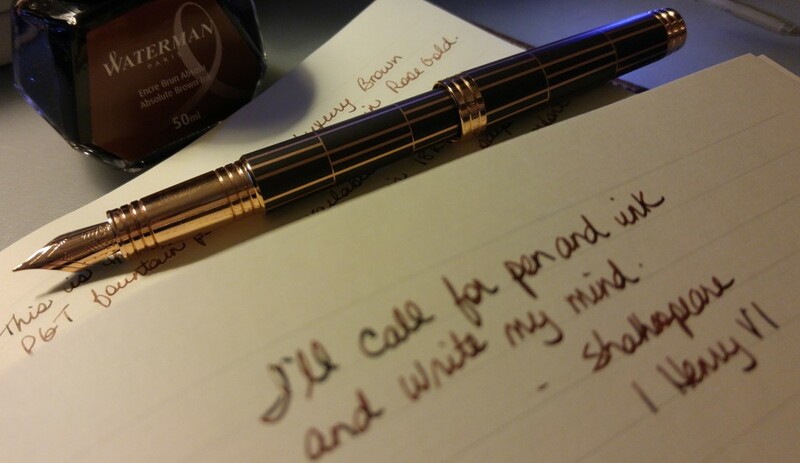 I have one of those pens on my wish list so it was good to see the review. Kind of moves it down the list as I don’t like light feeling pens. Love the notebook cover! Yes I agree Missy, I prefer a heavier pen. The Fuliwen is definitely not heavy. It would be better posted but my cap just fell off when posted. Maybe you will get a better one! The pen does nothing for me, but I ordered a bottle of Blue on the Plains of Abraham this morning. Interesting blue isn’t it? Hope you enjoy it.